If you visited my IWSG post in December, you know that I struggled with depression last year, but I did a lot of awesome things in 2017, even with that burden. 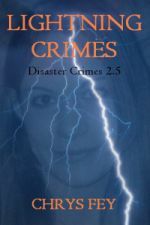 - self-published Lightning Crimes and made it perma-free. - At SCBL, I was part of an author panel. - Also at SCBL, I did my first recorded interview with Hangin with Web Show. 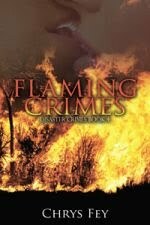 - signed a contract to publish Flaming Crimes. - In August, I did a radio interview with Off the Chain. 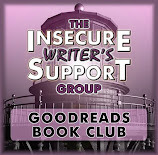 - Then I did a live YouTube Interview with Evan Carmicheal for the IWSG. I did a lot I am proud of, and I am looking forward to 2018. 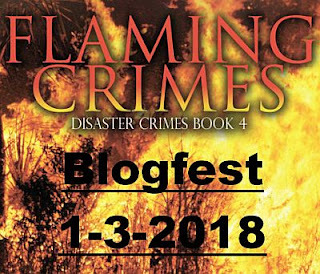 And kicking off 2018 is the release of Flaming Crimes! After your family, pets, and important items are safe and sound (that includes anything writing related), what is the one odd thing you'd want to grab from your home? MY ANSWER: When a brush fire threatened my childhood home, my mom grabbed a bag of potatoes from our house. That seems like a rather odd thing to grab, right? Well, she’ll tell you that she was a mother of five and wanted to make sure she could feed her kids. And just like that, saving a bag of potatoes sounds reasonable. It was this memory that inspired the blogfest prompt. He's missing his nose and beard, but I love him! I was only a child when that fire surrounded my house, and I was terrified. I remember grabbing my blanket and my school backpack, but I was so scared that I didn't go back inside to grab anything else. 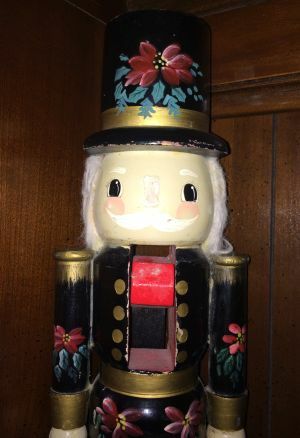 If I had, I would've grabbed my favorite Nutcracker, which I still have. I believe it would be the one thing (after my pets and writing stuff) I'd want to save from becoming ashes. I love that your mom grabbed a bag of potatoes. Makes perfect sense from a mom perspective. What a scary thing to have experienced as a child. Congrats on your new release and Happy New Year! It really does make sense, but it still makes me laugh to think about. Thank you! Happy New Year!!! Wow, you've had an intense year! Congrats on getting all that done, plus starting off the new year with a big bang of a book release! Looking forward to reading the this firey adventure. I loved the qquote at the begining Chrys. I hope your depression has gone. Not a pleasant thing to encounter as I well know. It was lovely reading of your achievements. Good luck with your blogfest. I hope my depression stays at bay this year, too. Congrats on an amazing year!!! What a way to kick off the new year with a new release! Hope there are a few more to follow in the rest of 2018. Congratulations! My enthusiasm for a lot of things petered out by the end of the year. I hope to spark life back into everything in this one! I think that happens to a lot of us, especially last year. You've accomplished a lot this past year. Congrats! Good luck with your new book! LOL! I'll tell her you said that. She'll love that. Love that story about your mom. She's such a great lady! Congrats on the new book!! That's such an awesome way to start off the year. The fire must have been terrifying. Grabbing a sack of potatoes made perfect sense. I feed my 5 sons potatoes every single night. Thankfully, potatoes are still their favourites. Feliz Ano Nuevo, Chrys. I suspect that 2018 if going to be a fabulous year for us both. Best to you. Potatoes was our favorite side dish, too. Wow - what an amazing 2017 you had, and 2018 is off to a fabulous start! I love the fire theme and the inspiration of your new project. Such interesting insights from your childhood experience, watching your mother - what a great story! Congrats on the release and all of your achievements. I'd save my Minion collection. Or my photo albums. (All 300 of them!) I'm sure the fire would be out long before I finished, too. Your Minion collection is EPIC! You definitely achieved a lot in 2017. Here’s to another year of achievements in 2018. Wouldn’t think of grabbing potatoes but it makes sense. And as a mom, I’d grab the photo album too. I can count the number of photographs of me as a baby and a young child on less than 10 fingers. Even my grandmother who passed away last year three weeks after 100th birthday didn’t have any photos of her as a child or as an adult. Now, I’ve lots of pictures I’ve taken during high school, college and afterwards. And though I don’t always order pictures when there’s picture day every year, I do try to purchase some when I can. I don't have many pictures of myself as a baby anymore, either. I actually put together a scrap book with a handful of my favorite baby pictures last week. There's also pictures of pets I don't have anymore and my favorite pictures of my family. I even added drawings my nephews did when they were little. It's on my bookcase, so I hope I'd remember to grab it. I guess that's the one good thing about technology, you don't have to worry about digital pictures burning up. Unless you left the device and didn't upload them somewhere else, like Photobucket or DropBox. Congratulations on your new book! Good luck with your plans for this year. I'd absolutely save my 30-year-old stuffed cat Davy, who's been worn thin and threadbare. He's my Velveteen Rabbit. 2017 was a productive year for you. Congrats on the new book release. I love the blurb! We had a fire in our last apartment a few years back. It was very scary. Just took my purse, keys and phone. But turned out we couldn't go back in for a week and then we had to find a new place to live. Next time, I would probably take a box of letters from my grandmother. I don't have much to remember her by except those letters. I guess that's not a weird thing tho. Maybe a bottle of wine...haha. That must have been extremely scary for you as a child! Good luck on your blog-hop!! That does sound very scary. A couple of years after that brush fire, we had an electrical fire in my house due to an old TV and a candle. It was contained to the TV, but so frightening. A box of letter from your grandmother is special. I didn't get to know my grandmas, but I've felt a connection to my paternal grandmother who died when I was two. If I had letters from her, I'd want to save them, too. I can see your mom's thinking there. She'd be more worried about her kids than herself. You did a lot of great things in 2017! I just subscribed to your YouTube channel. I've got one too, but it's mostly music from recitals I've done. Maybe I'll work on creating videos about my books. It's probably a good marketing tool for authors. Your experience when you were a child sounded scary. I'm glad you got out unharmed! That must have been scary, having a fire surrounding your house. And I understand perfectly why you'd want to save the nutcracker. Congratulations on all your accomplishments in 2017! It still haunts me today. The only good thing to come out of it is this book. It sounds like you're in a much better place right now and that is wonderful news. Congratulations on all your 2017 accomplishments! That's quite a list. Hope you have another great year of positive things. That's a good thing to save! I'd probably have to save my boxed copy of The Hobbit - it's gorgeous! You did SO much in 2017 - hoping 2018 is even more successful for you!! Wow, Chrys! You slayed it in 2017! House fires are so devastating. I lost the one & only draft of my first book in a house fire many years ago. Back in the day where you wrote it out on paper or pecked it out on an old manual typewriter. It took me years to return to writing. Best wishes for a happy, peaceful, productive 2018! I am so sorry to hear about your loss. I once lost the only draft of book that I completed, and I haven't tried to write it again. It's been ten years. Best wishes to you for a wonderful 2018! I hope so. :) See you on the 10th! He was very loved, especially when I was younger. I adored him. I would have grabbed the boxes of Kraft Mac and Cheese instead of the potatoes, but maybe that's just me. 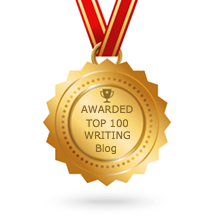 :) It sounds like you had a pretty productive year writing-wise. I hope to have a year like that someday. Well, I actually didn't write much at all because of my depression, but I was productive in other ways. I honestly can't think of anything ridiculous I'd want to rescue from our house during a fire. My hubby, our cats... and me. In that order. Then again, in the chaos of an actual fire, there's no telling what I or anyone else might grab. Your mom's choice is very touching. Thank you, Susan! I hope so. :) But I do plan to take it easier this year, to prevent that nasty depression from returning. You're right. In real life, there's no telling what you'd grab or what you'd do. My son would probably try to save his enormous Lego collection. Thanks for hosting the blogfest! A huge congrats on an awesome year, Chrys. You accomplished so much. And now you are starting your new year with an awesome new book release. Wishing you tons of successes this year. Sounds like you had a good year. May 2018 be even more exciting. You're starting it off right, with a new book, and more to come. Congratulations. 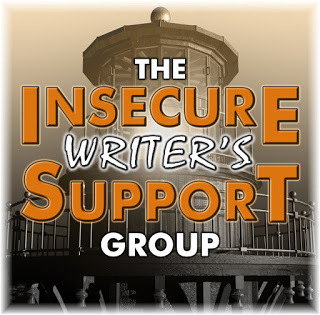 Congratulations on all your wonderful accomplishments!I've been seeing your blog fest all over IWSG and it has me really pondering what I'd save. Very though provoking and I haven't come up with an answer...I love your mom's potatoes though. That speaks of such love. Congrats on the release and all of your accomplishments last year! I love the story about the potatoes. Congrats on how well you did in 2017, all the more impressive for getting all that done while dealing with depression. I have a friend who calls this kind of list her to-done list (as opposed to a to do list), and it can really help you deal with feeling like you are spinning your wheels, just to write out what you *did* get done. Congratulations on the new release and all you've accomplished this last year! Wishing you success, health and happiness in 2018! Thank you so much for this cool hop and for stopping by my blog. I love the new book. Congratulations on the release and everything you accomplished in 2017. Looking forward to your Sparks book. Wishing you all the best with your 2018 goals. Thank you, Toi! I’m glad you like my blog hop. Hi Chrys. You've achieved so much in 2017 and into 2018. Well done you. Once again, sorry time didn't allow me to participate in your blogfest of host you. I'm working harder toward publication this year. I know it's up to me to push forward. Luckily I have a store of what I believe is fine writing to sort/edit/publish. No worries, Denise. I understand. Writing is more important. I’ll be blogging less this year so I can write more. Best of luck to you with your publication goal! It sounds like you were a busy bee in 2017. That's awesome. I bet you had fun at the book events. I think I tried to stay busy to keep negative thoughts away. I enjoyed what I did, though. The book events were the best. I am amazed at all you accomplished last year, Chrys, esp. all the public appearances and speaking engagements. You should be very proud of yourself. 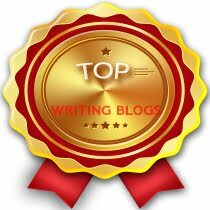 You also come up with the best blogfest. I love them almost as much as your books. :) Wishing you much success with this new release. Your 2017 achievements are an inspiration, Chrys. I've got no excuses now for 2018. That bag of potatoes makes total sense. When my mother was a child, she was evacuated from Jersey when the Nazis invaded the Channel Islands. She was only able to take a small suitcase and the family lost almost everything they had there. I know that traumatised her as she clung on to possessions for the rest of her life. That would be truly traumatizing. I can’t even imagine what anyone who went through that endured. Way to go, Chrys! You really did have a productive 2017! Kudos! Congrats on the blogfest. I'm seeing it everywhere today. I have no idea what silly thing I would grab on the way out of the house, lol. Probably a bottle of wine to fall apart with later. Or whatever gifts are still under the bed waiting to be given away. I hope you are as productive in 2018, without the depression, of course. Thank you! All the best to you for 2018! Congratulations Chrys, you achieved a lot in 2017, hope you achieve more in 2018. 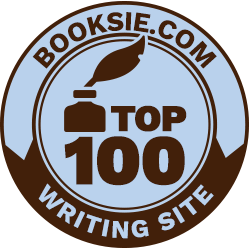 Good luck with all your writing goals this year. That must've been so scary for you when the fire happened. It sounds like 2017 was a productive year for you. Best wishes for a great 2018. It was very scary. I still fear fires to this day because of that event. Potatoes were a good choice - if we can't eat, we can't do much else, can we? It sounds like you had a very successful 2017 even dealing with depression and all that comes with it. Congrats on your book, your Youtube channel and so much more! That's awesome! I hope you have just as much success, if not more, in 2018! I'm so sorry you had to deal with a fire as a kid. The good thing is that the only other object you said you would have considered saving is an object you still have! Yes. It's amazing because I collected nutcrackers when I was little and all of them broke after moving from place to place. All of them except my favorite one...the one I would've saved. Congratulations on all you accomplished last year. That's quite the list! And depression is no joke. I've battled it off and on for 10 years, since I first found out I deal with a couple of Auto-Immune diseases. Ugh. Take care of yourself and keep being awesome!!! Happy New Year! I am sorry to hear about your struggles. My depression first started 10 years ago, too, and it got worse because of my back problems, which led to disability. Congrats! You got a lot done. Potatoes! That was a smart move. Wow, you got a lot done! Congratulations on your publishing contract, Chrys! Congratulations on a very productive year! You also did something I didn't think could be done--got a contract for a second book in a series after self-publishing the first. Food for thought. Bravo, Chrys, on your new release. 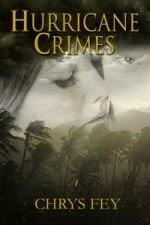 I always like your Crimes novellas. You certainly have had an amazing year. Here's to every blessing in 2018. Thank you, Victoria! 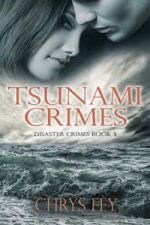 Hurricane Crimes is the only novella, though. The others are considered novel-length. Woot! You can relax now. Your wait for one of my highly regarded, much acclaimed comments has finally arrived at your delightful blog. Wow, you've just had one busy year. Good positive resources for you to utilise. Of course, you've also experienced some traumatic events. Despite it all, you have proven determined resilience against your depression. For you, my remarkable friend, will never ever give your depression permission to overwhelm you. You have demonstrated, as such, by how much you've managed to accomplish. Congrats on your release. I'm still waiting for a pardon from the Governor. A peaceful, positive and inspiring 2018 to you, Chrys. Thank you for such a thoughtful and kind comment. You boosted me up with your words. Happy New Year, Gary! May you receive only the best for 2018. Awesome use of 2017, Chrys! Lots of variety to keep the inspiration free flowing. As an avid nutcracker collector, now you have me thinking I should store my Christmas collection somewhere with easier access. Usually I don't think beyond, pets, clean underwear, phone and lap top! You collect nutcrackers? :D I used to have about fifty of them when I was little, all because of the one in this post, but after moving again and again they all broke. I have the nutcracker pictured here in my curio cabinet. A few others are on top of the curio cabinet. Trying to get them would probably be tough. Wow! You had a lot of great things happen in 2017. Yeah! How can you be sure it wasn't the nutcracker who started the fire?? Just kidding! Congratulations on your new release and for your many awesome accomplishments in 2017. Wow Chrys, you did alot in 2017!! I am so happy for you and proud of you! Congrats on the new book! I love the story about the potatoes! I think I would grab my very first teddy bear! Big Hugs! I am so happy for you and all your successes. Despite your depression, you have managed to make the best out of life. Such an inspiration. Congrats! May 2018 bring you more joy. All the best for you in 2018! You had such an amazing year and I admire your accomplishments so much knowing you were battling depression along the way. Congratulations on knocking 2017 out of the park! 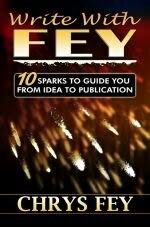 I didn't realize you had signed a contract for the Write With Fey book, somehow I totally missed that. Wonderful news!! That was some quick-thinking on your mother's part grabbing those potatoes. Congrats on the fest and on the fantastic new release!! Congrats on all your achievements, Chrys! You have a lot to be proud of. Here's hoping 2018 brings you more (I'm sure it will). Love the story of your mother grabbing a bag of potatoes. That says so much about who she is. Would be great to use in a novel to show character. That was definitely a great year, especially appearing at the book events. It can take a lot to put yourself out there. The Nutcracker looks like a jolly fellow - I can see why you'd want to save him. Congrats on Flaming Crimes and good luck for 2018! Last year, putting myself out there as an author was my goal. Something I had never done before. I've enjoyed your visit today as have the blogster buds. How is having a perma free working out for you? Do you feel it's drawn interest and helped your sales? You closed your blog hop linky thing! 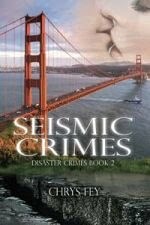 I finally published and promoted your book. It closed before the hop went live. I can manually add your post back. No worries. your blogfest was a huge success! i saw many great posts! congrats on Flaming Crimes! loved the place and sharing! best wishes to your projects my friend! Love the blogfest! I've been seeing you and your wonderful book all over the place. Huge wishes for epic success. A nutcracker, eh? Honestly, in my younger days I might have saved a multitude of strange things. These days I'd probably go straight for the photo albums--the ones I don't have digitized. Truthfully though, I'd run for my computer: home of all family pictures and books. Photo albums, especially if they aren’t in digital, is a must. As I mentioned in another post, I'd save my journal, or I'd save my laptop because both of them have my writing in them. I wish I could leave my cell phone behind, but I'd need that for an emergency like that one. And congratulations on a successful year and the new book! You really did accomplish a lot, and that's great! I’d have to try to rent to grab my cellphone, too. In an emergency like this, one is definitely needed.